I love all the colors *swoon*...so the sweater came like that?? 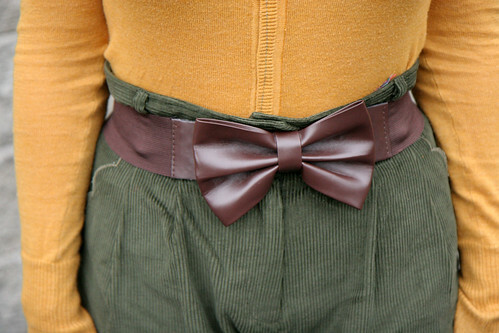 Sometimes UO amazes me with handmade look of things, you know what i mean? I love your outfit! <3 We used to have a bar in my city (Christchurch) called Goodbye Blue Monday! It really was quite lovely, but sadly the earthquakes knocked it over! Boo! Oh Katie this outfit is just amazing! I love the amazing mix of colours together! All my favourites in one outfit. Just perfect. This is a great look!! I love the sweater and the tights! darling! I love the way the colors come together in this one. 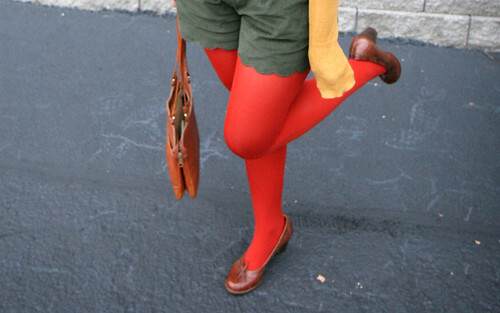 I adore the shorts and tights look, though I haven't been brave enough to try it yet. i am wearing those exact same tights today! so fun! those are amazing shorts though! the color, the cut! just perf! and woweee your shirt has a kitty on it. what a cute surprise! I need that sweater yesterday. Aah your hair + outfit = Love. Very CUTE! 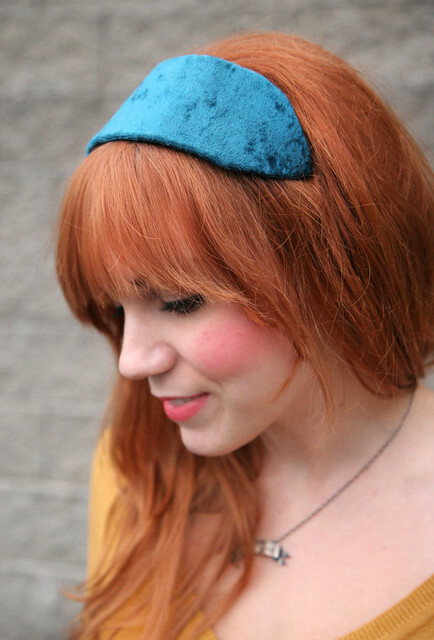 LOVE that blue velvet hairband against your red hair- gorgeous! love the music clip from yesterday too. now following.....found you via etsy blog team. stop by mercantile muse when you get a chance! Ah I love this. Those shorts look great on you. And cats on clothes is always a plus. Be still my beating heart. You are such a beauty. My face is seriously glowing with joy for how perfect that statement piece looks on you. Proud mamma maker here. You look so cute! Wear shorts more often! You look so cute! 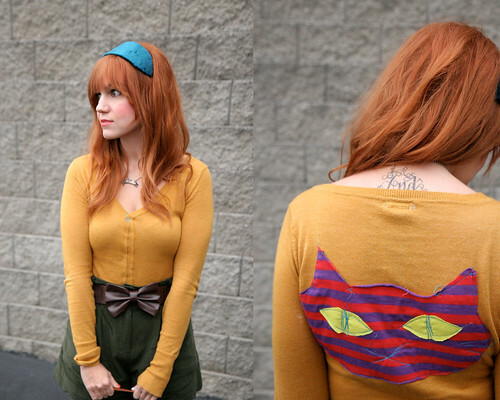 Love the Kitty sweater! You have so many colors in one outfit, but it looks cohesive yet artless. And I love your shoes. Glad that I stumbled onto your blog. This might sound really depressing, but seeing this post actually made me very happy. I always remember when I first discovered your blog reading a post about Laural Hill. I instantly loved her banner jewelry and promptly bought a piece that said "Adventures and Happiness". I loved it so much because it made me think of one of my best friends and I gave it to her as a present. She and I were always wanting and going on adventures. She had cancer and in the last few years we really made an effort to live life to the fullest. She wore the pendant on her coat all the time. This last February she passed away and her husband gave me the pendant to keep and remind me of her. I love this outfit! That sweater is super sweet, and I think you look beautiful in those shorts. Oh my gah, that sweater is amazeballs! I don't wear shorts often either, but you look absolutely precious in them. I love all the colors in this outfit! 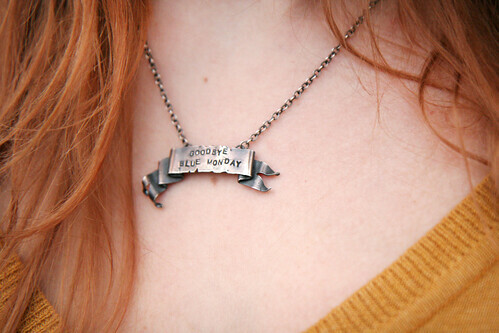 This necklace is beyond cute! Also love the adorable cat! Love love this outfit and those tights!! if i had a blythe doll, i'd dress it like you. Love this outfit Katie! Those shorts are so cute! I love the scalloped bottom and the color is lovely! Also what a cute sweater! I love the kitty on the back. you are so adorable! i wish i could wear the things you do do, seriously. that sweater is so cute!! 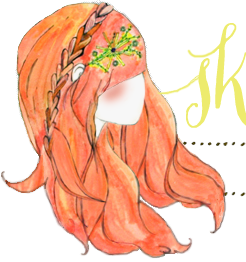 just visited your blog for the first time and i absolutely adore it!!! you wear an make the loveliest things.